Every time Facebook changes it’s interface it messes up everything and you can’t find where they used to be. Though they claim they are doing this for better usability. I am not sure about this as after last change it took awhile to find where is hidden button for adding more photos to existing album. I decided to post step by step screenshots how to do that because I think there are more people in trouble finding it. But I will start from the beginning and this week will show how to create new photo album on facebook and how to add your first photo. Press “Add Photos” button on the upper right corner of the screen. Press “Select Photos to Upload” button for dialog to open. Select photos you want to publish from your hard drive. 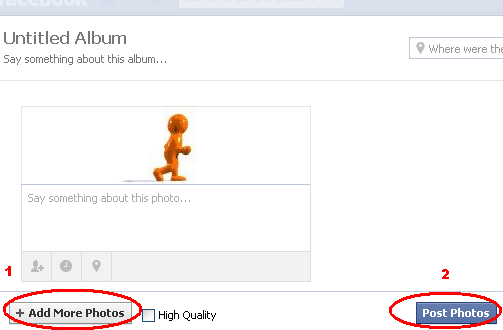 Then you can select more pictures  or publish your album  on your facebook timeline. That’s it. Next week I will post how to add more photos to already existing album on facebook.